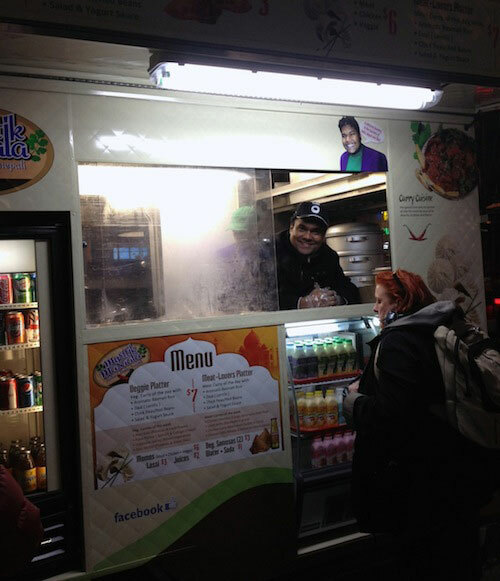 Last night, my friend Anne (of City Spoonful fame) and I decided to check out Mysttik Masaala, a new street cart in Astoria. They serve Indian, Tibetan, and Nepali food. This is the only cart of its kind in the neighborhood, and it’s very exciting to see them here, contributing to an expansion of already excellent street food in Astoria. And even better – the food is really terrific. The cart is located on Steinway Street, just south of Broadway, and they were doing a brisk business while we were there. Their offerings are modest right now, but we expect to see them expand in the future. The menu is as such: two platters – a veggie and meat-lovers; momos filled with either chicken, meat or vegetables; vegetarian samosas; and drinks, including bottled lassi (mango, sweet, salty, strawberry, and pineapple). As for the platter, it’s a lot of food, and we found our respective portions so filling we couldn’t finish them (caveat: we do not have hollow leg type of appetites normally, so YMMV). I absolutely loved my chicken momos, which had the perfect amount of sauce put on them (spicy red and less spicy yellow-orange sauce). The samosas (two to a serving) are wonderful, filled with a delicious vegetarian filling of potato and peas that is just a tad spicy. A sweet tamarind type sauce came with them (no sign of the common green sauce that often accompanies samosas). 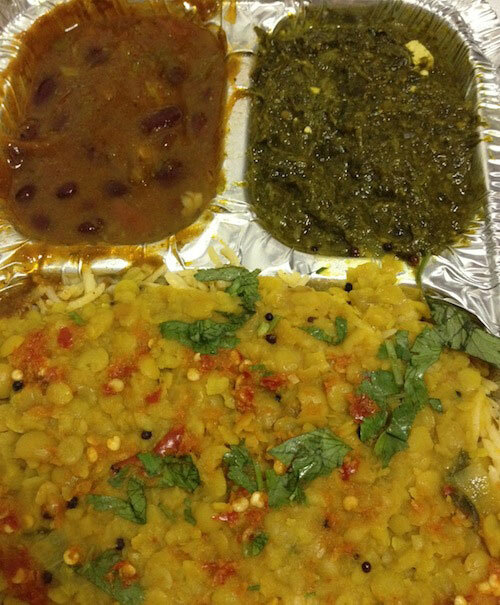 The platter consists of Daal (lentil soup) with rice, shown at the bottom; Rajma (kidney bean stew), in the upper left; and Palak Paneer on the upper right. I’m mostly used to this dish (the way it looks) as Saag Paneer with spinach, but the Palak Paneer is made with mustard greens instead, along with fresh cheese (paneer), all simmered with spices. I love its slight tang, really tasty. 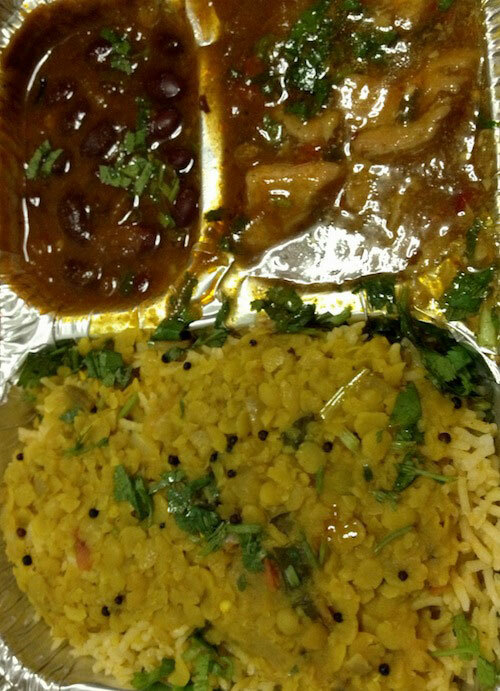 The Daal is on the bottom and the Rajma on the upper left. On the upper right is Thurrywala Chili Chicken, an Indian-Chinese dish. The chicken was simmered in gravy instead of cooked separately and doused with gravy, making it quite tender. Thanks to Anne for reminding me of the names of these dishes, too. 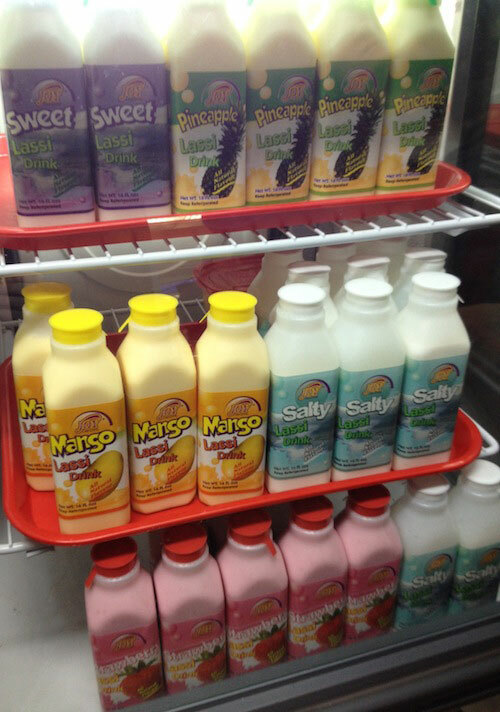 The sauces are excellent and have great flavor. 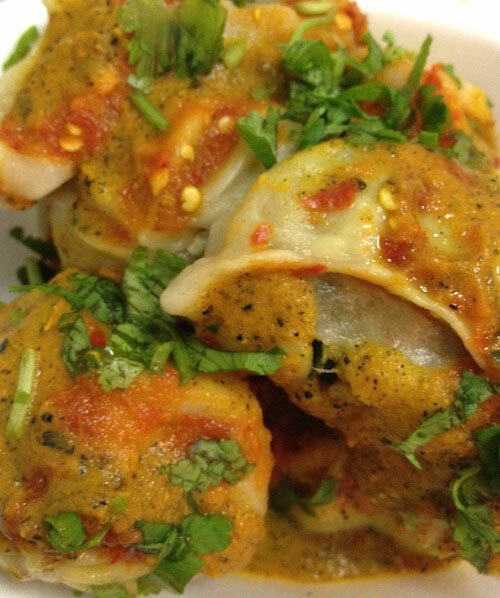 I tried the veggie momos and the chicken momos and prefer the chicken, but the veggie ones are great, too. They are made by Tashi, the former owner of Tawa Food in Jackson Heights. I loved how I was asked if I wanted cilantro on things (YES, PLEASE!). 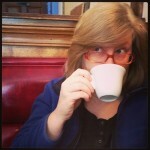 And sorry about no photo of the samosas, cuz I sort of, um… ate them before I could take a photo. They look like pretty standard samosas, but with amazing taste. My boyfriend gave them a thumbs up, too. While we were standing in line, Yuvaraaj offered us each a piece of Mithaii (an Indian sweet) that he is making and planning to sell at the cart. It is a burfi, very simple with a clean sweet taste, with almonds and pistachios throughout. It was crazy delicious – very fresh, soft, and not dry at all, as is sometimes the case with Indian sweets in NYC. I loved it and I hope to taste it again soon. Chaat is also coming soon to Mysttik Masala, including Samosa Chaat, Dahi Bhalla Chaat, and Papri Chaat. We have high hopes, after all Yuvaraaj is a native of Bombay — a city justifiably famous for these crunchy, refreshing, *chatpata* (aka, flavor-maxed) snacks. We’re also hoping he may add Vada Pao (http://sumanjsingh.wordpress.com/2010/06/04/vada-pav/) and/or Pao Bhaji (http://www.fewminutewonders.com/2010/06/pav-bhaji-for-100-or-for-4.html) to the menu — two particularly famous (and tasty!) Bombay chaats that are rarely found in NYC. Overall, this was a satisfying and exciting meal, with wonderful flavors and promises of more delicious food to come. 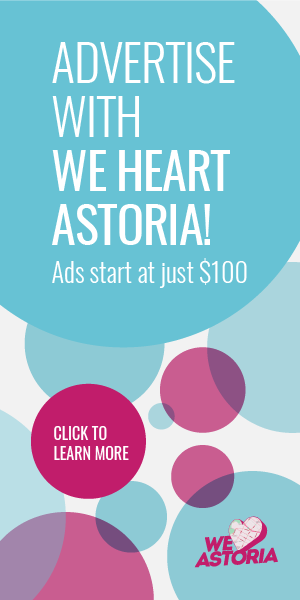 It’s a great addition to the Astoria street food scene. 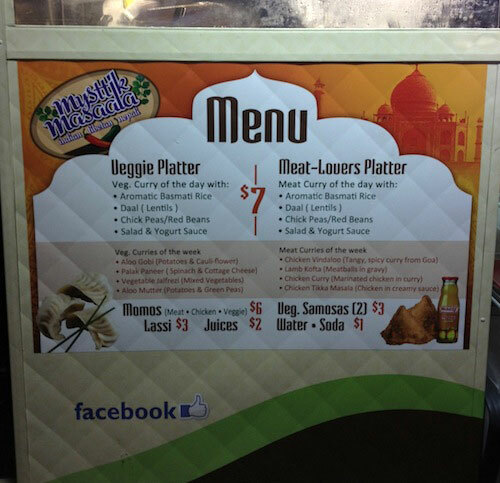 Be sure to stop over on Facebook and read Anne’s take on the food, too: Mysttik Masala: Indian, Tibetan, Nepali Street Cart Hits Astoria. Thanks also to Jeff from Queens Love, who originally told us about this cart. I was walking around the neighborhood with friends after a day of ball and I noticed this cart. First, the cart design is unique but the contents of the cart is what really matters. The food looked and smelt great but it even tasted better. Everything I ordered, from the dumplings to the basmati rice with chili chicken, had true flavor. Usually true flavor is lacking from cart food but thia isn’t the case here. Great food and best of luck to the owners! WOW, THIS GUY HAS CHARISMA. GOING TO TRY IT SOON!